ww2dbaseAs Henan Province, China fell under Japanese control, the city of Wuhan became the next defensive objective for the Chinese. Wuhan was the capital city of the Hubei Province, consisted of three smaller cities of Wuchang, Hankou, and Hanyang. It was the second largest Chinese city by population. It was situated on the Yangtze River and was strategically important both as an industrial center as well as a transportation hub. The Japanese understood its importance, and further ventured that should the Chinese regulars be defeated at Wuhan, coupled with the capture of top ranking Chinese leaders, organized Chinese resistance might be brought to an end entirely. ww2dbaseAerial attacks on Wuhan began long before the actual ground invasion. The first air strike took place on 28 Feb 1938, with rather inconsequential results. On 29 Apr, another aerial attack was called for in celebration of Emperor Showa's birthday, but the prepared Chinese air units achieved a small tactical victory by shooting down 21 Japanese aircraft, losing only 12 of their own. To defend against the eventual ground invasion, the Chinese gathered one million men, 200 aircraft, and 30 naval vessels. ww2dbaseThe battle of Wuhan invasion began on 11 Jun 1938 with a Japanese advance toward Anqing in an attempt to establish a forward staging base; Anqing was captured two days later on 13 Jun. ww2dbaseOn 23 Jul 1938, the Namita Detachment of Japanese 11th Army Group landed in the east of Jiujiang, which was defended by a regiment of the Chinese 9th Military District. The Chinese posed stiff resistance at first, but when Japanese 106th Division made their landings, the defenses were quickly driven back. Jiujiang fell on 26 Jul, but the 106th Division would face bitter resistance as it continued to march south on the west side of Panyang Lake. Moving eastward along the river, the Namita Detachment attacked Ruichang on 10 Aug alongside Japanese 9th Division, capturing it two weeks later on 24 Aug. Continuing to move eastward, Ruoxi was captured on 5 Oct. After consolidating their forces after a series of small victories in the region, the Japanese moved toward Wuchang on 22 Oct.
ww2dbaseIn the north of the Yangtze River, 6th Division of the Japanese 11th Army Group attacked Taihu from Anhui on 24 Jul. Taihu fell on 3 Aug. The 4th Army of Chinese 5th Military District set up the next defensive strongpoints at Guangji, Hubei, and Tianjia, while several companies were sent to harass the Japanese troops on the move. On 28 Aug, the Chinese launched an attack and recaptured Taihu, but the Japanese soon stopped the Chinese momentum in its infancy. The Chinese was driven back to Guangji, which fell under Japanese control along with nearby Wuxue. At Tianjia, Chinese 4th Army Group and 87th Army were obliterated by the Japanese superior firepower. Tianjia fell on 29 Aug. The city of Huangpo was captured on 24 Oct, and this Japanese advance was marching for Wuhan as well. ww2dbaseIn mid-Aug 1938, the Japanese 106th Division moved southward along the Nanxun Railway. The Chinese 1st Army Group, 29th Army Group, 4th Army, and 8th Army defended from advantageous terrain of Lu Shan, successfully driving back the initial advance. On 20 Aug, another offensive was launched after being reinforced by Japanese 101st Division, and a bitter stalemate ensued for the next month. In late Sep, five regiments of the 106th Division advanced into the Wanjialing region in the west in attempt to end the stalemate. Chinese general Xue Yue led the 4th, 66th, and the 77th Armies and counterattacked, stopping the Japanese advance in place. Japanese 27th Division then attempted to reinforce the five regiments, but they were held down by the Chinese 32nd Army, therefore unable to reach their intended positions. On 7 Oct, the Chinese launched an offensive and achieved in enveloping the Japanese. By 10 Oct 1938, the bulk of the encircled Japanese troops, five regiments in strength, were destroyed. ww2dbaseIn late Aug, the Japanese 2nd Group Army attacked the Dabie Mountains region in two pincers. The southern pincer defeated Chinese 77th Army quickly, capturing Huoshan. Pressing on, Shang City was captured on 16 Sep, and Ma city on 24 Oct. The northern pincer was also successful, taking Liuan on 28 Aug and Gushi on 6 Sep. Falling back to the natural barriers at Huang River, the Chinese 27th Army Group and 59th Army prepared the next line of defense, which lasted ten days before being forced out of their positions on 19 Aug. Luoshan fell on 21 Aug to the Japanese 10th Division as a consequence, but fierce Chinese defense beyond Luoshan stopped the Japanese momentum, and the Japanese found themselves at a defensive position for a number of days until reinforcements arrived. On 6 Oct, the Japanese offensive resumed, with the capture of Xinyang on 12 Oct. From there, the two pincers converged and began to move south along the Pinhan Railway for Wuhan. ww2dbaseWith Wuhan nearly encircled, Chiang Kaishek, who personally led the garrison in Wuhan, had a complete change of mind. Instead of fighting the second major battle in Wuhan as he originally planned (the first being the 1937 Battle of Shanghai), he decided to withdraw to the west and to the south in order to preserve his strength. Japanese troops marched into Wuchang and Hankou on 26 Oct, and Hanyang fell on the following day. The Japanese victory at Wuhan came at the heavy cost of 140,000 casualties. The Chinese, despite suffering 400,000 casualties, slowed the Japanese momentum significantly. 28 Feb 1938 Japanese aircraft bombed Wuhan, Hubei, China, causing little damage. 29 Apr 1938 Japanese aircraft attacked Wuhan, Hubei, China; Chinese fighters shot down 21 Japanese aircraft at cost of only 12 aircraft lost. 11 Jun 1938 Japanese troops began to march for Wuhan, Hubei, China. 12 Jun 1938 Japanese 11th Army captured the airfield outside of Anqing, Anhui, China. 13 Jun 1938 Japanese troops captured Anqing, Anhui, China. 17 Jun 1938 Japanese troops captured Qianshan County, Anhui Province, China. 24 Jun 1938 Japanese reached Madang, Jiangxi Province, China. 26 Jun 1938 Japanese Special Naval Landing Force troops landed behind Chinese lines at Madang, Jiangxi Province, China and captured the town. 4 Jul 1938 Japanese troops captured Hukou, Jiangxi Province, China, near the border with Anhui Province. 6 Jul 1938 Japanese minelayer Kamome struck a mine in the Yangtze River off Pengze, Jiangxi Province, China; she was towed away for repairs. 23 Jul 1938 The Namita Detachment of the Japanese 11th Army Group landed east of Jiujiang, Jiangxi, China. 24 Jul 1938 The 6th Division of the Japanese 11th Army Group attacked Taihu County, Anhui, China. 26 Jul 1938 Japanese troops captured Jiujiang, Jiangxi, China. 27 Jul 1938 Japanese 106th Division marched south from Jiujiang, Jiangxi Province, China. 3 Aug 1938 The 6th Division of the Japanese 11th Army Group captured Taihu County, Anhui, China. 4 Aug 1938 Japanese and Chinese troops clashed at Jinjiashan, Maanshan, and Datianshan south of Jiujiang in Jiangxi Province, China. 5 Aug 1938 In the morning, Japanese troops captured Huangdanao, Manashan, and Laohushan in Jiangxi Province, China. 6 Aug 1938 Japanese and Chinese troops clashed at Jinjiashan, Jinguanqiao, and Dengjiahe in Jiangxi Province, China, exchanging territories repeatedly throughout the day. 7 Aug 1938 Japanese troops captured Dengjiahe in Jiangxi Province, China. 8 Aug 1938 Troops of 90th Division of Chinese 4th Corps repulsed Japanese assaults at Shizishan, Muopanshan, and Jiaojiashankou in Jiangxi Province, China. On the same day, 15th Division of Chinese 8th Corps captured Datianshan, Jiangxi. After dark, Japanese troops attacked Maanshan. 10 Aug 1938 The Namita Detachment of the Japanese 11th Army Group and the Japanese 9th Division attacked Ruichang, Jiangxi, China, defended by the Chinese 3rd Army Company and the Chinese 32nd Army Group. 19 Aug 1938 Chinese 27th Army and the Chinese 59th Corps fell back from the defensive line at Huang River, Hubei Province, China. In Jiangxi Province, Japanese 101st Division began landing troops at Xinzi. 20 Aug 1938 Japanese 106th Division under Yasuji Okamura and the Japanese 101st Division launched an offensive in Jiangxi Province, China in an attempt to cut off Chinese troops in Nanxun and Wuning Railway. Chinese troops withdrew from Xinzi, Jiangxi Province after sundown, falling back toward Yikou. 21 Aug 1938 Japanese 10th Division captured Luoshan, Hubei Province and Xinzi, Jiangxi Province in China. 24 Aug 1938 Japanese troops captured Ruichang, Jiangxi, China. 28 Aug 1938 Chinese troops recaptured Taihu County, Anhui, China. 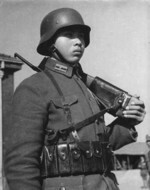 In Hubei Province, elements of the Japanese 2nd Army Group captured Liuan. 29 Aug 1938 Japanese troops captured Tianjia, Anhui, China. 6 Sep 1938 Elements of the Japanese 2nd Army Group captured Liuan, Hubei, China. 16 Sep 1938 Japanese troops captured the city of Shang, Hubei Province, China. 5 Oct 1938 Japanese troops captured Ruoxi, Jiangxi, China. 6 Oct 1938 Japanese troops resumed the offensive in the Dabie Mountains region of Hubei, China after being bogged down by Chinese troops for more than a month. 7 Oct 1938 Chinese troops launched a counteroffensive in Jiangxi Province, China and enveloped elements of the Japanese 101st and 106th Divisions. 10 Oct 1938 After three days of heavy fighting, the enveloped Japanese 106th Division was largely wiped out by Chinese troops at the Battle of Wanjialing in Jiangxi, China. 12 Oct 1938 Japanese troops captured Xinyang, Henan, China and began to plan for an attack south along the Pinhan Railway toward Wuhan, Hubei, China. 13 Oct 1938 Chinese troops withdrew from the Wanjialing area in Jiangxi, China, the site of a victory three days prior. 22 Oct 1938 Japanese troops reached the southern borders of Wuhan, Hubei, China. 24 Oct 1938 Japanese troops captured Huangpo, Anhui, China and began to march toward the northern border of Wuhan, Hubei, China. In the same province, elements of the Japanese 2nd Army Group captured the city of Ma. 26 Oct 1938 Japanese troops captured undefended Wuchang and Hankou (now districts of the city of Wuhan) in Hubei, China. All these WWII anecdotes are interesting. I hope they can continue. Would it be too much to ask that the writer (Mr. Chen) get someone to check his entries? It's obvious the gent is writing as ESL and the phrasing is awkward. Japan had been granted a large swath of territory in China as part of the Treaty negotiated to end the first Sino-Japanese war. In addition, Japan had been granted Germany's colonies in China (Shandong region) as part of the Treaty of Versailles. Did Japan go beyond those territories? Or was it just trying to hold onto them? Milt Morris: The city of Wuhan is something like 600 kilometers or 300 miles from Shandong, thus far beyond their WW1 acquisitions.